Rose (Rosa damascena) is grown as an ornamental plant in every region of Turkey and in some provinces it is also grown for production of essential oil. However, virus diseases affecting roses in Turkey have not been well characterised. Rose yellow vein virus (RYVV), has not been reported from Turkey. The virus belongs to the recently described genus Rosadnavirus in the family Caulimoviridae. Symptoms of infection with RYVV are vein banding or central vein chlorosis in infected leaves (Milleza et al., 2013). In the summer of 2016 and 2017, symptoms consistent with infection with RYVV were observed on leaves of roses in the Canakkale and Ankara provinces of Turkey (Fig. 1). Twenty six samples showing RYVV-like symptoms were collected from the two provinces. The samples were stored at -80°C for further analyses. Total nucleic acid was extracted from the stored samples using the CTAB method (Li et al., 2008). Extracts were then tested by PCR with primers designed in this study (RYVV-F1 5′-CGAGATTAACGAAATGGAC-3′ and RYVV R1 5′- CGTACTCTTTCTTGGCTT-3′) to amplify the partial coat protein (CP) gene of RYVV (GenBank Accession No. JX028536). PCR tests were done using Emerald 2× PCR master mix (Takara, Japan) according to the manufacturer’s instructions. A PCR product of the expected size (766 bp) was obtained from 15 of the 26 samples. The PCR product from one sample was chosen randomly and purified and submitted for Sanger sequencing. The partial CP gene sequence of the chosen isolate was deposited in Genbank (MH395928). The presence of RYVV in Turkey was confirmed through sequence identity to other RYVV isolates using BLAST. Different RYVV sequences from New Zealand (JX887425 - JX887426) and USA (JX028536) were used for sequence analysis. The identities at nucleotide and amino acid level between Turkish and other RYVV isolates were determined using a partial 663 bp sequence of the CP gene after alignment with ClustalW, and ranged from 96-97% and 97-98% identity, respectively. The phylogenetic relationship of different RYVV isolates was determined using the neighbour-joining method and the Turkish isolate clustered with other RYVV isolates (Fig. 2). To our knowledge, this is the first report of RYVV in Turkey. With previous reports only from New Zealand and the USA this finding of RYVV also represents the first report in both Europe and Asia, suggesting the virus may be more widely distributed than previously reported. 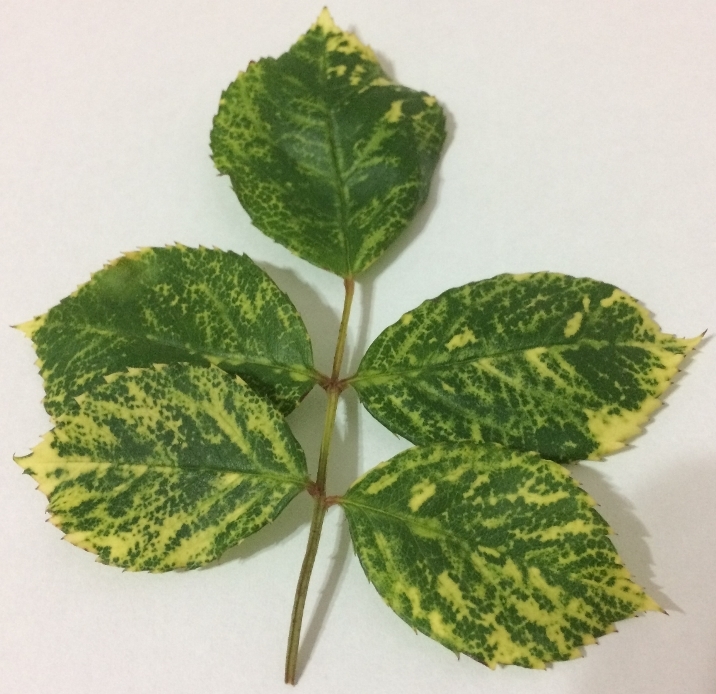 Figure 1: Severe vein banding symptoms on leaves of Rosa damascena caused by Rose yellow vein virus. Figure 2: Phylogenetic relationship between Turkish and other Rose yellow vein virus isolates. Phylogenetic tree based on partial sequence of the coat protein gene and created by the neighbour-joining method applying Kimura80 parameters with 1000 bootstrap replications after ClustalW alignment in CLC Main Workbench v7.7.3. Cauliflower mosaic virus (CaMV) and Dahlia mosaic virus (DMV) were used as outgroups.